My interest in Argentina began when I saw the film La Historia Oficial or The Real Story. This film was made in Buenos Aires in 1985 and presented a very real-seeming, disturbing image of life in the immediate aftermath of la Guerra Sucia. The Guerra Sucia, or the Dirty War, took place between 1976 and 1983, when the Argentine military took over the government under the leadership of General Jorge Rafael Videla. Over the course of the film, the main character discovers that her adopted daughter was a child of one of the many "disappeared" subversives who were abducted and then executed by the dictatorship during this period. She searches for her daughter's birth records in city hospitals and adoption agencies, and also makes an inquiry through the Asociación Madres de la Plaza de Mayo. This is an organization of mothers and wives of the disappeared who, since 1977, have marched every Thursday on the Plaza de Mayo which sits before the Casa Rosada, where the executive branch of the government conducts business. They march in protest of the dictatorship and in demand of information about what has happened to their children. At the end of the film, there is a note explaining that this footage was real, that these women were not actresses, but the Madres themselves, and that they continue to march today. This idea did a lot to activate my curiosity about Argentina. It was hard to imagine so many people still living with the after effects of such a flagrantly inhumane government. I watched more films, read more and took classes on the subject and as prying questions of "what next?" began to arise towards the end of college, I decided it was time to head south. I arrived in Buenos Aires about two months ago. It is strange to be here and think of what I have learned about the Dirty War. I had wanted to have experiences that would help me understand the whole history, to see and hear things that would turn it into more of a reality in my mind. Instead, I find myself wandering around, noticing the occasional pro-Peronist graffiti on sides of buildings, looking at older people and wondering what this political history means to them, trying to understand how it fits in with Argentine society now. I don't hear it mentioned in conversations, nor do I read much about it in the news. In such a vibrant city, where most people seem so carefree and content, it is hard to imagine that such a thing has happened. Until recently, I wondered if the whole thing might just escape me, if I would only find an alarming absence of this history in life here. This changed towards the end of November, when I read that the ashes of Azucena Villaflor de Devincenti, one of the founding members of the Asociación Madres de la Plaza de Mayo, would be placed at the monument of the Plaza. The newspaper article explained that after her husband was abducted in 1977, Villaflor began organizing with other wives and mothers of the disappeared to mobilize the Madres movement, until she herself was abducted at the end of that same year. For the next twenty-eight years, Villaflor's family had no knowledge of what had happened to her. Then, in June of 2005, a group of forensic anthropologists identified her remains, along with those of several other desaparecidos, whose bodies had been recovered and buried in the cemetery of General Lavalle, an outlying zone of the Buenos Aires province. Testing revealed that Azucena, like many others, was a victim of what have become known as the military "death flights". Throughout the dictatorship, military employees at la Escuela de Mecánica de la Armada (School of Naval Mechanics) would take small groups of incarcerated dissidents and tell them that they were to be transported to a different prison. After dissidents boarded military aircraft, officers told them that they were to be vaccinated against a particular illness that was common to that prison, whereupon a military doctor would inject them with a sedative called Pentotal. Once the sedative took effect, they were stripped naked and dropped from a hatch to fall thousands of feet into the Atlantic Ocean and to their deaths. On that Thursday, the day of the Virgin, virtually all of the shops and restaurants and office buildings in Buenos Aires were closed. It was cloudy and the air was cool. I walked through the empty business district of microcentro until I heard drumming and saw flags waving at the end of Calle Reconquista. I turned and walked until I came to the Plaza de Mayo. Hundreds of people were marching, singing and handing out information about the disappeared. Hundreds more watched. Around its circular perimeter, vendors sold sodas, chorizo sandwiches, Argentine flags and hot water for mate. Signs in the crowd demanded justice and the truth and displayed the names and photographs of people who had disappeared, all in their twenties or thirties, all smiling, some with other family members, some with pets. A chain link fence that separated the Plaza from the Casa Rosada was covered with endless rows of enlarged, black and white photographs of the disappeared. The Juventud Evita was there in numbers, shaking tambourines, singing and waving huge flags with Eva Peron's face painted on the front. And then there were the Madres, all of whom wore white kerchiefs on their heads, announcing their cause. Many had strings with pictures of their children hanging from their necks and they all marched together, gingerly, their arms linked. Reporters and cameramen followed them, gently holding furry microphones to their mouths. One woman, taller than the rest, spoke calmly into a hand-held tape recorder and those around her nodded in agreement. A man with a microphone summoned Azucena's family and the Madres to step inside the low gates around the pyramidal monument at the center of the Plaza. People moved toward the gates and packed in tight to watch. The man to my left held a little boy on his shoulders. The woman next to me ground her elbow into my side in an effort to get a better view. Azucena's daughter, Cecilia DeVincenti, poured her mother's ashes into a hole in the ground. Then she spoke, describing so many years of wondering if her mother would appear one day, of wondering if she would ever know what had happened to her. I craned to see her face, becoming increasingly frustrated with the woman next to me who continued to elbow me in the side. I finally turned my head, planning to give her a look that would encourage her to stop, but when I did this, my eyes fell immediately on her chest, where she had pinned a photograph of a young guy sitting in a lawn chair, smiling, a bottle of Coke in his hand. A few handwritten words at the top explained that he had been missing since 1981. She had tears in her eyes. I looked around and saw that many people were crying. Silently, not sobbing or sniffing, but people were crying, tears running wet lines down so many cheeks in the crowd. Then the history stopped being just a story, or a fiction. The permanence of this lack of information, of this hole in peoples' lives, suddenly overwhelmed me. After Cecilia and one of the original founders of the Madres spoke, the man with the microphone closed the ceremony by telling everyone to resume marching. "Resume marching this afternoon, right now," he said, "but keep marching forever." The crowd loosened and the Madres slowly made their way out of the gates and began to march. Other groups and people from the crowd followed. The rally ended just as it had begun. Although today was a special day, it was still a Thursday, and every Thursday, there is a march. So we marched. As I joined these people, slowly walking around the monument, mostly silently, passing the same signs and flags and silhouettes of buildings, the circularity of our path suddenly making perfect sense. These women were taking a permanent stand, persevering in their statement, knowing that they would never get what they really wanted, but that what they were communicating would be important forever, that this history would not be forgotten. It was so different from what I have seen and participated in at home. Stop the war, impeach the president, legalize gay marriage, all of those goals, however important, seemed so simple in this moment. When we think of social change in the United States, we automatically envision tangible results. The protests and the rallies and the meet-ups always derive a sense of means, of means to an end, where as here, the only goal is to keep going, to keep moving in this circle so that no one will ever forget those years of their history and so that hopefully, no one will ever repeat them. 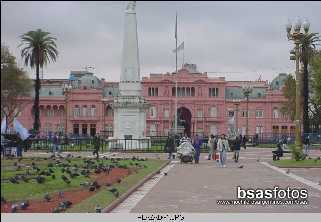 I stopped and watched for a while, noticing the Casa Rosada, its salmon hue making it stick out, as if it were blushing shamefully in the background of the scene. I took a photograph, picked up several flyers and went home. A body should really be able to order cable channels individually. If I just want TNT (who knows drama, by the way) why should I also pay through the nose for SpikeTV? Let’s get the Internet working on this. A body should really be able to order cable channels individually. If I just want TNT (who knows drama, by the way) why should I also pay through the nose for SpikeTV? Let’s get the Internet working on this. Rollover for entire idea.